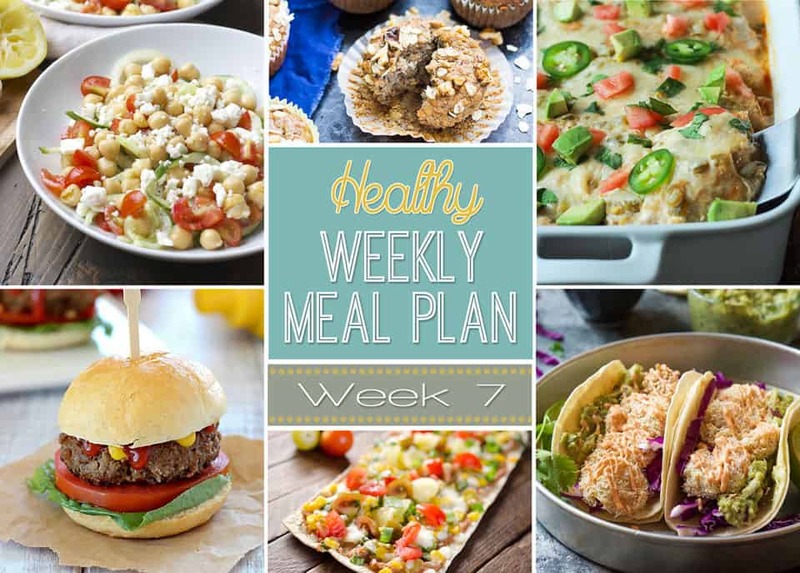 Welcome to week seven of our Healthy Weekly Meal Plan! This week we are bringing the spice with everything from buffalo chicken and chipotle egg salad to bang bang shrimp! Of course we lightened them all up for a week of healthy meals and treats you can feel good about. With the weather quickly cooling down, a little bit of heat in your meal will warm you right up. Enjoy! Kick of the week right with this Light Tex Mex Thin Crust Pizza for an easy and healthy Meatless Monday. 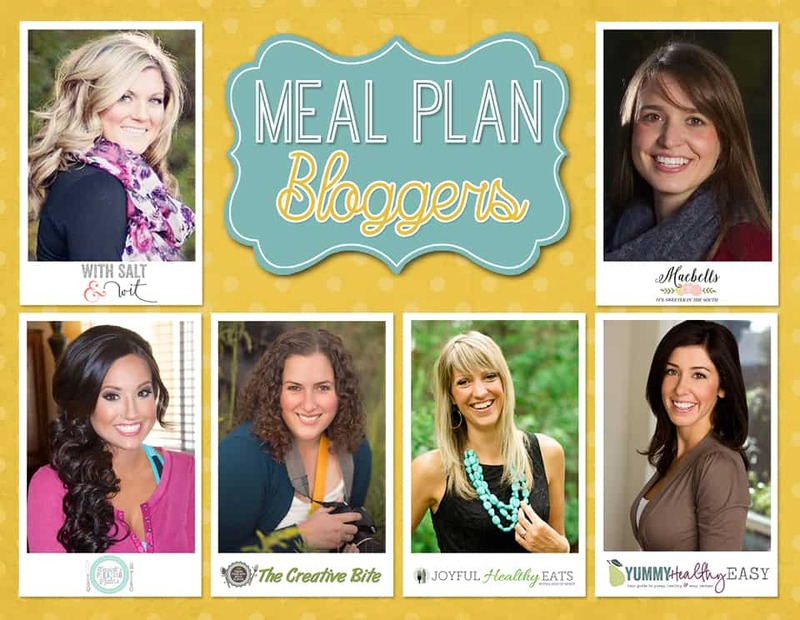 It has all the great Tex Mex flavors you love without all of the fat and calories! I can’t wait to come home to these amazing Slow Cooker JalapeÒo Carnitas waiting in my Crock Pot for the perfect Taco Tuesday! They are a cinch to make and totally addictive. Now these Blue Cheese Beef Sliders are something seriously good to look forward to mid-week! Juicy, flavorful sliders are not only delicious, but they are super easy too! Serve them up with these crispy Garlic Parmesan Zucchini Chips for a perfectly healthy meal that your whole family will go nuts for! These easy Buffalo Chicken Flatbreads come together in minutes and make a perfectly easy dinner. Crispy buffalo chicken tenders, crunchy celery and salty blue cheese crumbles all atop a warm garlic flatbread for a mouthwatering meal. This Cucumber Chickpea Salad is packed with spiralized cucumbers, cherry tomatoes, chickpeas, feta and tossed in a simple lemon vinaigrette for a light and fresh meal. Spice up your lunch with this Light Chipotle Egg Salad. It is a quick and healthy lunch idea bursting with spicy chipotle flavor for a twist on this classic lunch! Saturday night never looked so good with these 20 Minute Skinny Baked Bang Bang Shrimp Tacos, a skinny makeover of a restaurant classic! What is better than gooey caramel and a chocolate chip cookie?! This Deep Dish Salted Caramel Chocolate Chip Blondies made with wholesome ingredients! These Lightened Up Maple Banana Nut Oatmeal Muffins are a great way to start off your Sunday morning. Walnuts and oats paired with sweet bananas and hints of sweet maple make these muffins irresistible! No butter or oil! Kids and adults alike will all be drooling over these unbelievably delicious Peanut Butter Oat Balls made in minutes, with only a few wholesome ingredients. I love ending my week with some healthy comfort food and this Easy Chicken Enchilada Recipe topped with a Creamy Green Chili Sauce thatís made with Greek Yogurt, smoked paprika, and spicy green chilies is right up my alley!